Many businesses use Google Drive to hold company files. And as long as there are businesses, there will be slideshows. But what if you have to develop a presentation with a colleague who is not in the same location as you? That's where the collaborative power of Google Drive comes into play, and Google's own Chrome app Google Slides makes collaborating on presentations as simple as your collaborators will let it be. As Google's download page puts it, Slides is good for "shiny 6-pagers or 600 page snoozefests." In other words, the only restriction on the size of the file is how much space you have free in Google Drive. You can make your slide presentations with a variety of themes, and rich animations. You can leave comments on the file for your colleagues. All in all, it's a much better working arrangement than endless email threads and tedious telephone conferences. 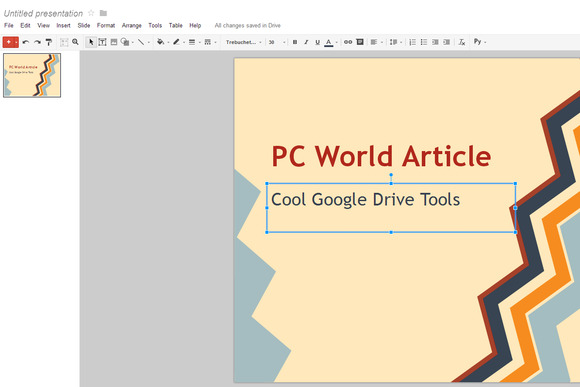 Google Slides makes perfectly good presentations that you store in Google Drive, where you can collaborate on them with co-workers. And what's even better: You never, ever have to hit a save button. Everything you do is automatically and instantly saved in real-time. Beat that, PowerPoint.